The Krafla central volcano forms a low, broad shield some 25 km in diameter, with a caldera in its centre. The caldera measures about 10 km east-west and about 8 km north-south. It formed during the last interglacial period and has since been filled almost to the rim with volcanic material. The collapse of the caldera probably followed the eruption of a sheet of dacitic welded tuff which is exposed around the caldera. This welded tuff was produced by an explosive eruption within the Krafla caldera. A lava shield with a diameter of about 20 km existed prior to the caldera formation. The Krafla fissure swarm is about 90 km long and 4-10 km wide, with over 1000 tectonic fractures. Historical accounts mention only one eruption episode in the Krafla-Námafjall fissure swarm in the years 1724-1729. Contemporary descriptions of this eruption, the "Mývatn fires" exist. The lava flows cover an area of about 34 km and the total length of the discontinuous volcanic fissure is 11 km. A minor volcanic eruption was reported on the same fissure in 1746 accompanied by earthquakes and ground movements. Field investigations indicate that it occurred to the north and south of Leirhnjúkur located near the centre of the Krafla caldera. 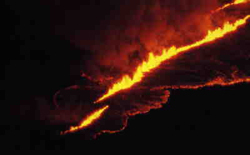 The events that took place in the Krafla caldera and on the Krafla fissure swarm during 1975-84 (The Krafla fires) are a striking repetition of what happened during the "Mývatn fires" in the 1720's. Following the last eruption of this episode in September 1984, the Krafla magma chamber inflated again eventually fully recovering previous land elevation. During 1989-92 land subsided at 5 cm/yr but during 1992-95 by 2.4 cm/yr. The volcanism within the Krafla system is compositionally bimodal, the historic volcanism is being dominated by tholeiitic basalt production. Compiled by Guðrún Sverrisdóttir in January 2012.